The small town in northeastern Ohio where I grew up doesn’t have any fancy pants restaurants. There are no organic grocery stores, and you’d be hard-pressed to find any substantial ethnic food (Chinese takeaway, pizza joints, and a Tex-Mex place don’t count). For some, this may sound like the gastronomic doldrums. But whenever I return to Ohio to visit my family, I get excited about comfort food, top-notch pizza, and summer days filled with the sweetest corn on the cob, lazy backyard grilling, and veggies and berries fresh from the farmer’s stands dotting the countryside. Since I’m such a food nerd, my ma and pa always have food and restaurant ideas lined up for me when I come to see them. When I returned to Ohio this time after over a year of being out of the States, my first week alone brought me deep-fried turkey for Easter; a bag full of ramps my dad bought from a toothless lady on the side of a West Virginian country road; s’mores assembled over a fire in the backyard; and my grandma’s homemade bread and brown gravy. Like all good comfort food, my grandma’s brown gravy is laden with calories and carbs and sodium. In this case, health benefits are derived from bacon grease, flour, evaporated milk, and a pile of salt. 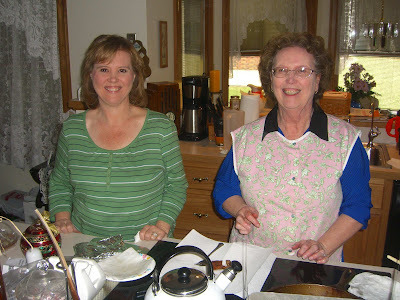 My grandma learned to make the humble brown gravy from her mother, who had twelve children to feed on an extremely tight budget in the West Virginian coal-mining camp where they lived. Fancy it is not, but boy does it fill the tummy and bring a smile to the face. The first step to a proper brown gravy is to render the fat from about ten slices of good bacon. 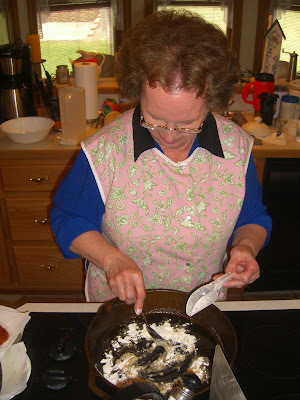 My grandma uses her well-seasoned cast-iron skillet and a bacon press. She also erects a metal wall around the burner so as not to splatter bacon grease on the rest of her counter. 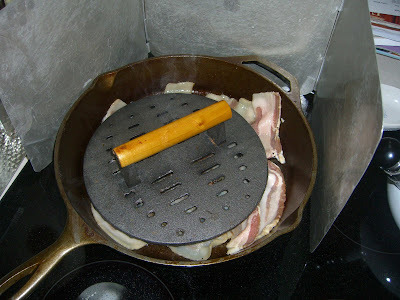 Once the fat is rendered from the bacon, she removes the bacon, leaving behind the grease. To this she gradually adds flour, stirring constantly, to make a golden brown roux. Once the roux is sufficiently amber-colored, she adds a can of evaporated milk all at once off the heat of the burner and stirs, stirs, stirs, scraping the bottom of the skillet, until the gravy is thick and all lumps have disappeared. This simple gravy requires a fair amount of salt and black pepper, so after the correct consistency has been acquired, grandma tastes and seasons the gravy until it is just right and a little on the salty side, just like we like it. She then tears slices of her dense homemade bread into chunks and pours over a generous ladle of brown gravy. And I am instantly transported to my childhood. 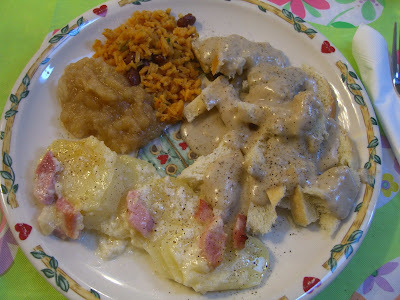 This time, she served her bread and brown gravy with ham-studded scalloped potatoes, applesauce, and my other grandma’s Puerto Rican rice. An authentically American plate of food, to be sure! Brown bacon and render fat in a heavy cast iron skillet. Add one cup flour and stir to make a brown roux. 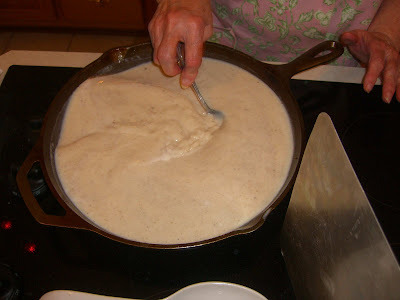 Off the flame, add evaporated milk and three milk cans full of water all at once to gravy. Stir constantly over medium heat, scraping bottom, until thick. Add salt. Serve over homemade bread torn into pieces, with plenty of freshly ground black pepper.